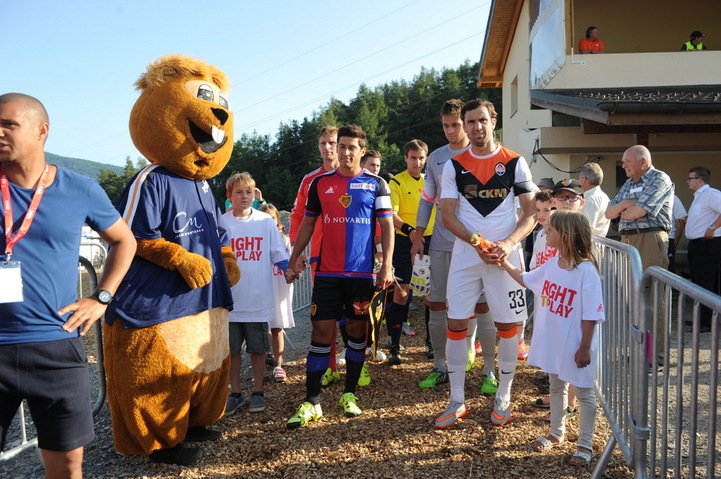 On July 9, the Pitmen faced Basel in the second match of the Valais Cup. A number of changes took place in Shakhtar’s starting line-up, compared to the first match in the Valais Cup. Anton Kanibolotskiy was stationed in goal. Vyacheslav Shevchuk was operating at left back and Vasyl Kobin partnered Taras Stepanenko in the middle of the pitch. The Pitmen took control of ball possession from the off, but as early as on 5 minutes our team conceded a goal: Yanko fired a first time shot following a Traore cross from the left flank to make it 1-0. After that, Shakhtar spent almost the whole time in the opposition half of the pitch, forcing Basel to defend. On 22 minutes, Hladkyi had a hance to score an equaliser, but sent the ball just wide of the goal post. After some time, Shevchuk delivered a good cross to the far post but Oleksandr failed to get on the end of it. But it was Hladkyi who netted goal for Shakhtar before the break: on 33 minutes, he found an ideal position inside the penalty area before heading the ball in after a cross from Srna – 1-1. After the break, Pyatov, Ordets, Malyshev and Azevedo took to the pitch, and in the middle of the first half, Mircea Lucescu provided Bernard with a match practice. Shakhtar dominated proceedings, constantly orchestrating attacks in the Basel half of the pitch. One of them resulted in a powerful shot from Rakitskiy – the opposition goalkeeper made a save. After a minute, the Swiss goalkeeper came to rescue his team after Hladkyi’s attempt to seal his brace. The Pitmen did not give the opponents a chance to take the lead. Instead, Shakhtar scored themselves: Malyshev won the ball in the centre, Marlos advanced with the ball before making a pass to Teixeira, who set up Hladkyi to make it 1-2. Five minutes from time, the Pitmen cemented their lead thanks to a Marlos goal.